10th lunar month of 1688: born in Edo. It is said that his father Ichikawa Danjûrô I prayed at the Narita Fudôson temple in order to have a son and the deity Fudô Myôô granted his wish. 5th lunar month of 1697: he makes his first appearance on stage and receives the name of Ichikawa Kuzô I, at the Nakamuraza, in the drama "Tsuwamono Kongen Soga". The play was written by his father and the young Kuzô plays the roles of a yamabushi priest and the deity Fudô (Kabuki Jûhachiban). 11th lunar month of 1700: Ichikawa Danjûrô I and Kuzô move to the Nakamuraza, where they play the roles of Kimpira and Kaidômaru in the kaomise drama "Kimpira Rokujô Gayoi". He delivers his first lines during this performance. 11th lunar month of 1701: Kuzô plays in the same theater the role of Tanba Suketarô in the kaomise drama "Keisei Ikazuchi Mondô". 7th lunar month of 1702: Kuzô and his father Ichikawa Danjûrô I achieve a great success by playing in the same theater the roles of the 2 Benkei ("Ninin Benkei") in the drama "Shinpan Takadachi Benkeijô". 10th lunar month of 1702: Kuzô plays in the same theater the role of Shintoku in the drama "Yûgao no Kannon Hôben". 11th lunar month of 1702: Ichikawa Danjûrô I and Kuzô move to the Moritaza and perform together in the kaomise drama "Tenchijin Tsutsumamori". Kuzô plays for the first time the superhero role (Izumi Kojirô in this performance) in a "Shibaraku" scene. 4th lunar month of 1703: Kuzô plays in the same theater the roles of Kûkai and the deity Fudô in the drama "Naritasan Bunshin Fudô". 7th lunar month of 1703: Kuzô plays in the same theater the role of Ike no Shôji in the drama "Oguri Jûnidan". 11th lunar month of 1703: Kuzô and his father move to the Ichimuraza. He plays the role of Araômaru in the kaomise drama "Genji Rokujûjô". 19th day of the 2nd lunar month of 1704: his father Ichikawa Danjûrô I is killed in the backstage of the Ichimuraza by his rival (in love ?) Ikushima Hanroku. 7th lunar month of 1704: Ichikawa Kuzô I, who is only in his sixteenth year, takes the name of Ichikawa Danjûrô II at the Yamamuraza, playing the aragoto role of Ôe Yatômaru in the drama "Heianjô Miyako Sadame". The costum is identical to the one used by his late father when he performed the bombastic role of Konpira and there is a big tachimawari scene to please the audience. 1704 ~ 1709: Danjûrô's career stagnates because of the influence on theater management of some enemies of his late father. Getting mainly minor roles, he uses his free time to study with enthusiasm, following some strong principles: always put literature at the top of the list, respect others people, live discreetly, no selfishness, no laziness. He also makes regular pilgrimages to the Narita Fudôson temple, praying the deity Fudô Myôô to go beyond his father's artistic accomplishments. 11th lunar month of 1706: Danjûrô plays the role of Kimpira at the Yamamuraza in the kaomise drama "Kaeribana Buyû Kagami", which celebrates the arrival in Edo of the Kamigata actor Takeshima Kôzaemon I. 11th lunar month of 1706: premiere in the same theater of the drama "Taihei Shusse Kagekiyo", which is considered as an earlier version of the Kabuki Jûhachiban drama "Kagekiyo"; Danjûrô plays the role of Sasaki Takatsuna [casting]. 3rd lunar month of 1707: Danjûrô's rank in the Edo hyôbanki, tachiyaku section, is jô (superior). 11th lunar month of 1708: Danjûrô plays at the Yamamuraza the role of Hayato in the kaomise drama "Yorimasa Shiki Samba". 3rd lunar month of 1709: Danjûrô's rank in the Edo hyôbanki, tachiyaku section, is jô-jô (superior - superior). 7th lunar month of 1709: Danjûrô achieves a triumphant success at the Yamamuraza, playing the role of the uirô peddler Kumehachirô, in the "Mogusa Uri" scene of the drama "Keisei Hibari Yama", whose main character is the famous Princess Chûjô. This role, with fast-spoken lines, will become in 1718 the core of the "Uirô Uri" scene. His stage partners are Yamanaka Heikurô I, Ikushima Shingorô, Ogawa Zengorô I and Nakamura Gentarô, who plays the role of Princess Chûjô. There is also a "Zôhiki" scene integrated within this summer drama. 11th lunar month of 1709: Danjûrô plays in the same theater the aragoto role of Arajishi Otokonosuke in the kaomise drama "Taihei Okuni Kabuki", which celebrates the arrival in Edo of the Kamigata actors Asao Jûjirô, Arashi Sanjûrô I and Fujikawa Buzaemon I. 1st lunar month of 1710: Danjûrô plays in the same theater the role of Sanada Yoichi in the new year program "Keisei Izu Nikki". 9th lunar month of 1710: Danjûrô plays in the same theater the role of Tôgorô in the drama "Ômi Genji". His stage partner in the role of Sasaki Moritsuna is Murayama Heiemon III. 11th lunar month of 1710: Danjûrô plays in the same theater the role of Ôe Saemon, challenging on stage the villain Ôtani Hiroemon I in the role of Danjô Saemon, in the kaomise drama "Jinriki Teika Azuma Asobi", which celebrates the arrival in Edo of the Kamigata actor Arashi Kiyosaburô I. 1st lunar month of 1711: Danjûrô plays in the same theater the role of Soga Gorô Tokimune in the new year sogamono "Yunzei Yomeiri Soga". His stage partners in the roles of Soga Jûrô Sukenari, Kudô Saemon Suketsune, the courtesan Kewaizaka no Shôshô (Gorô's lover), the courtesan Ôiso no Tora (Jûrô's lover) and Kobayashi no Asahina are Ikushima Shingorô, Ôtani Hiroemon I, Sakata Oginojô, Nakamura Gentarô and Ôtani Hiroji I. 11th lunar month of 1711: Danjûrô plays in the same theater the role of Ukishima Danjô in the kaomise drama "Shida Konjiki no Uroko". 1st lunar month of 1712: Danjûrô's rank in the Edo hyôbanki, tachiyaku section, is jô-jô-kichi (superior - superior - excellent). He plays in the same theater the role of Hayata in the new year program "Fukuwara Yunzei Yorimasa". 1st lunar month of 1713: Danjûrô plays in the same theater the role of Ishiyama Genta in the kaomise drama "Ishiyama Genta Kimon Yaburi" ("Ishiyama Genta Tearing Down the Demons Gate"). 3rd lunar month of 1713: premiere at the Yamamuraza of the play "Hana Yakata Aigo Zakura", which is the first "Sukeroku" drama (Kabuki Jûhachiban) in Kabuki history. Danjûrô plays the leading role of Sukeroku [casting]. 7th lunar month of 1713: Danjûrô plays in the same theater the role of Zenkô in the drama "Zenkô Naniwa Ike". His stage partner in the role of the villain Tôhei is Yamanaka Heikurô I. 11th lunar month of 1713: Danjûrô plays in the same theater the role of Kazusanosuke in the kaomise drama "Sasare Ishi Nasu no Futabashira". 2nd lunar month of 1714: Ejima, a court lady who serves the shogun, is in love with the star Ikushima Shingorô. Their affair is discovered in the backstage of the Yamamuraza. This incident, which Breaks the boundaries between samurai and commoner, is a serious crime for the shogunal authorities which decides to deal ruthlessly with the culprits: Ejima and Ikushima Shingorô are exiled to different places, those in the Shôgun's household who are held responsible are executed, the Yamamuraza is definitively closed and its management is heavily fined. It goes without saying that Danjûrô has to move to another theater. 5th lunar month of 1714: Danjûrô moves to the Moritaza and plays the role of Daitôji Tabatanosuke in the drama "Aigo no Waka". 7th lunar month of 1714: Danjûrô plays in the same theater the role of Kanemichi in the drama "Kinkazan Ôtomo no Matori". 11th lunar month of 1714: Danjûrô moves to the Nakamuraza and plays the role of Kamakura Gongorô Kagemasa (the superhero in the "Shibaraku" scene) in the kaomise drama "Banmin Daifukuchô". The villain of the play is the Kurozuka ogress, performed by Yamanaka Heikurô I. 1st lunar month of 1715: Danjûrô plays in the same theater the role of Soga Gorô Tokimune in the new year drama "Bandô Ichi Kotobuki Soga". 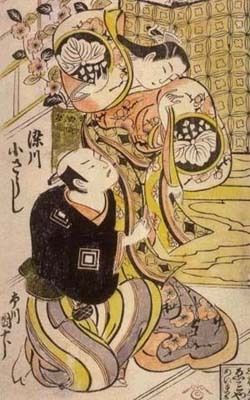 The roles of Soga Jûrô Sukenari, Kudô Saemon Suketsune, the courtesan Kewaizaka no Shôshô (Gorô's lover) and Kobayashi no Asahina are played by Katsuyama Matagorô, Ogawa Zengorô I, Nakamura Takesaburô I and Tomizawa Hanzaburô I. 5th lunar month of 1715: Danjûrô plays in the same theater the role of the wicked priest Narukami in the drama "Narukami Jônin". The role of Princess Taema is played by Nakamura Takesaburô I. 7th lunar month of 1715: Danjûrô plays in the same theater the role of Fuwa Banzaemon in the drama "Mimasu Nagoya". The performance is a successful long run (from the 15th of June to the 8th of September). 9th lunar month of 1715: Danjûrô plays in the same theater the roles of Yume no Yoshisada and Shinozuka Gorô in the drama "Wagô Taiheiki". 11th lunar month of 1715: Danjûrô plays at the Nakamuraza the role of Endô Musha in the kaomise drama "Kogane no Kaburi Konrei Yorimasa". 11th day of the 1st lunar month of 1716: a fire breaks out in the district of Shitaya Ike-no-Hata and spreads to others sections of Edo, destroying both the Ichimuraza and the Nakamuraza. Danjûrô has to take some unintended vacation during the rebuilding of the theater. 2nd lunar month of 1716: Danjûrô plays in the same theater the role of Soga Gorô Tokimune in the new year drama "Shikirei Yawaragi Soga". The roles of Kudô Saemon Suketsune, the courtesan Kewaizaka no Shôshô (Gorô's lover) and Kobayashi no Asahina are played by Hayakawa Dengorô, Nakamura Takesaburô I and Ôtani Hiroji I. The play includes a "Sukeroku" section in which the roles of Sukeroku, Agemaki and Ikyû are played by Danjûrô, Nakamura Takesaburô I and Ôtani Hiroemon I. 7th lunar month of 1716: Danjûrô plays in the same theater the role of Soga Gorô Tokimune in the drama "Zenji Soga". 11th lunar month of 1716: Danjûrô plays in the same theater the role of Imai Shirô Kanehira in the kaomise drama "Mitsudomoe Katoku Biraki", which celebrates the shûmei of Arashi Kiyosaburô II. 1st lunar month of 1717: a fire breaks out the 22nd in the district of Koishikawa and spreads to others sections of Edo, destroying both the Ichimuraza and the Nakamuraza. Danjûrô has to take some unintended vacation during the rebuilding of the theater. 2nd lunar month of 1717: Danjûrô plays in the same theater the role of Soga Gorô Tokimune, in reality the otokodate Karigane Bunshichi, in the new year drama "Kaidô Ichi Muneage Soga". The roles of Kudô Saemon Suketsune, Soga Jûrô Sukenari, the courtesan Kewaizaka no Shôshô (Gorô's lover) and Kobayashi no Asahina are played by Ichikawa Sukejûrô, Tomizawa Hanzaburô I, Nakamura Gentarô and Ôtani Hiroemon I. 5th lunar month of 1717: Danjûrô plays in the same theater the role of Watônai in Chikamatsu Monzaemon's drama "Kokusen'ya Takarabune" [casting]. 7th lunar month of 1717: Danjûrô plays in the same theater the roles of Daikyôji no Mohei and Zenjibô in the drama "Hoshiai Narukami Soga". 9th lunar month of 1717: Danjûrô plays in the same theater the role of Oguri Kanzô in the drama "Chôyô Oguri no Sekku". 11th lunar month of 1717: Danjûrô moves to the Moritaza and plays the role of Shinozuka Gorô in the kaomise program "Hônô Taiheiki". His stage partners are Hayakawa Dengorô, Ôtani Hiroemon I, Ogawa Zengorô I, Asao Jûjirô and Ichikawa Monnosuke I. 1st lunar month of 1718: Danjûrô plays in the same theater the role of Soga Jûrô Sukenari in the new year drama "Wakamidori Ikioi Soga". The role of Soga Gorô Tokimune is played by Sodeoka Shôtarô. Danjûrô plays also the leading role of the "Uirô Uri" scene (Kabuki Jûhachiban), which is performed in the second part (nibanme) of this program. The performance is a successful long run (from January to the 7th lunar month of 1718). 9th lunar month of 1718: Danjûrô plays in the same theater the role of Seijûrô in the drama "Shikirei Imagawajô". The role of Onatsu is played by Ichikawa Monnosuke I. 11th lunar month of 1718: Danjûrô moves to the Nakamuraza and plays the role of Kawazu Saburô in the kaomise drama "Hirakana Yomeiri Izu Nikki", which celebrates the arrival in Edo of the Kamigata onnagata Sanogawa Mangiku. 1st lunar month of 1719: Chikamatsu Monzaemon's play "Sonezaki Shinjû" is performed for the first time at the Nakamuraza, starring Danjûrô and Sanogawa Mangiku in the roles of Hiranoya Tokubê and the courtesan Ohatsu (Tokubê's lover). Danjûrô plays also the role of Soga Gorô Tokimune in the sogamono "Kaibyaku Sakayaki Soga", commonly called "Ninin Kudô" ("The two Kudô"), sharing the stage with the 2 jitsuaku Hayakawa Dengorô and Yamanaka Heikurô I in the Kudô roles. 9th lunar month of 1719: Danjûrô plays in the same theater the role of Chûshichi in the drama "Osome Hisamatsu Shinjû" ("The double suicide of Osome and Hisamatsu"). The roles of Osome and Hisamatsu are played by Nakamura Kiyosaburô I and Sanogawa Mangiku. The performance is a great success. 11th lunar month of 1719: Danjûrô moves to the Moritaza and plays the role of Murakami Hikoshirô in the kaomise drama "Banmin Taiheiki". 1st lunar month of 1720: Danjûrô plays in the same theater the role of Soga Gorô Tokimune in the bombastic "Ya-no-Ne" scene, included in the new year drama "Yuzuriha Kongen Soga", which commemorates the 16th anniversary (17th memorial service) of the passing away of Ichikawa Danjûrô I. Danjûrô's incredible performance is a huge success. His stage partner in the role of Soga Jûrô Sukenari is Sawamura Sôjûrô I. He also performs in duo with Sanjô Kantarô II in the shinjûmono "Shinjû Kasane Izutsu", which commemorates the 16th anniversary (17th memorial service) of the suicide of the couple Tokubê (played by Danjûrô) and Ofusa (played by Kantarô) [more details]. 2nd lunar month of 1720: Danjûrô's rank in the Edo hyôbanki, tachiyaku section, is goku-jô-jô-kichi (extreme - superior - superior - excellent). 11th lunar month of 1720: Danjûrô plays at the Moritaza the roles of Watanabe no Taketsuna (created by Nakamura Shichisaburô I) and Sakata Kintoki (created by Ichikawa Danjûrô I) in the kaomise drama "Kaigô Sakiwake Shitennô". Danjûrô's performance is well received by the audience and the critics praise him for mastering to perfection two different acting styles. 1st lunar month of 1721: Danjûrô plays in the same theater the role of Soga Gorô Tokimune in the new year sogamono "Nigiwai Suehiro Soga". His stage partners in the role of Soga Jûrô Sukenari, Kudô Saemon Suketsune, the courtesan Kewaizaka no Shôshô (Gorô's lover) and Kobayashi no Asahina are Mimasuya Sukejûrô I, Ogawa Zengorô I, Sodesaki Miwano I and Narumi Goroshirô I. The performance is a tremendous success. 5th lunar month of 1721: Danjûrô plays in the same theater the role of Kamiya Jihê in Chikamatsu Monzaemon's drama "Shinjû Ten no Amijima". The role of Koharu is played by Sodesaki Miwano I. 11th lunar month of 1721: Danjûrô moves to the Nakamuraza and plays the role of Kantô Koroku (the superhero in the "Shibaraku" scene) in the kaomise drama "Torisaka no Jô Tsuru no Sugomori". 1st lunar month of 1722: Danjûrô plays in the same theater the roles of Soga Gorô Tokimune and Yodoya Tatsugorô in the new year sogamono "Ôkamado Akinai Soga". He achieves a great success in duo with Sakata Hangorô I, who plays the role of Kobayashi no Asahina wearing a maegami wig, in a kusazuribiki scene. 8th lunar month of 1722: Danjûrô plays in the same theater the role of Kijûrô in the drama "Hana Môsen Futatsu Haraobi". His stage partners in the roles of Ochiyo and her lover Hanbei are Arashi Wakano I and Nakamura Shichisaburô II. Danjûrô's performance, which reminds the connoisseurs of his father's ones, is well received. 11th lunar month of 1722: Danjûrô plays in the same theater the role of Nitta Yoshisada in the kaomise drama "Hônen Taiheiki". 1st lunar month of 1723: Danjûrô plays in the same theater the role of Soga Gorô Tokimune in the new year sogamono "Soga Koyomi Biraki". The roles of Soga Jûrô Sukenari and Kudô Saemon Suketsune are played by Mimasuya Sukejûrô I and Ogawa Zengorô I. Danjûrô and Ôtani Hiroji I perform together in a spectacular aragoto roof-demolishing scene (yane kuzusu) at the end of the program. 5th lunar month of 1723: Danjûrô plays in the same theater the role of Minamoto Yoshitsune in the drama "Yoshitsune Kunkôki". 11th lunar month of 1723: Danjûrô plays at the Nakamuraza the role of Sano Genzaemon Tsuneyo [print] in the kaomise program "Sono Enpô Onna Migyôsho", which celebrates the arrival at the Nakamuraza of the Kamigata actors Yamashita Kinsaku I and Sanogawa Senzô. 1st lunar month of 1724: Danjûrô plays in the same theater the role of Yamagami Gennai, in reality Sano Genzaemon Tsuneyo, in the new year program "Matsu Kazari Kamakura Biraki". 2nd lunar month of 1724: Danjûrô plays in the same theater the role of Hanaoka Gontarô in the drama "Keisei Asama-ga-Dake", which commemorates the 16th anniversary (17th memorial service) of the passing away of Nakamura Shichisaburô I. 3rd lunar month of 1724: Danjûrô plays in the same theater the role of Hidari Jingorô in the drama "Irifune Sumidagawa". 7th lunar month of 1724: Danjûrô plays in the same theater the role of Soga Gorô Tokimune in the drama "Minori Kuru Hoshiai Soga"; the roles of Soga Jûrô Sukenari, Kudô Saemon Suketsune and Kobayashi no Asahina are played by Mimasuya Sukejûrô I, Ogawa Zengorô I and Narumi Goroshirô I. 11th lunar month of 1724: Danjûrô plays the role of a Komusô priest in the kaomise program "Taiheiki Okuni Kabuki", which is produced at the Nakamuraza. His stage partners are Sawamura Sôjûrô I, Yamashita Kinsaku I, Matsumoto Kôshirô I and Ichikawa Monnosuke I. 1st lunar month of 1725: Danjûrô plays in the same theater the roles of Sanada Yoichi and Doi Yatarô in the new year program "Funadama Izu Nikki". His hayagawari performance is very well received by the audience. 5th lunar month of 1725: Danjûrô plays in the same theater the role of Tadanobu in the play "Goban Tadanobu". 11th lunar month of 1725: Danjûrô plays in the same theater the role of Ike no Shôji in the kaomise program "Oguri Chôseiden", whose plot and characters belong to the "Oguri Hangan" world. 1st lunar month of 1726: Danjûrô plays in the same theater the roles of the wicked priest Narukami and Shuten Dôji in the new year program "Kadomatsu Shitennô", which commemorates the 22nd anniversary of the death of Ichikawa Danjûrô I. His stage partner in the role of Princess Taema is Yamamoto Hanasato. Danjûrô performs also the "Uirô Uri" scene. This new year program is a triumphant success. Summer 1726: Danjûrô performs in the same theater in the play "Suehiro Nagoya". He portrays Fuwa Banzaemon, confronting Sawamura Sôjûrô I in the role of Nagoya Sanza in a great "Sayaate" scene. 11th lunar month of 1726: Danjûrô plays in the same theater the bombastic role of Kamakura Gongorô Kagemasa in the kaomise program "Kaomise Jûnidan", which includes the great "Shibaraku" scene. 1st lunar month of 1727: Danjûrô plays in the same theater the role of Soga Gorô in the new year sogamono "Yuzuriha Gongen Soga" [print]. His stage partner in the role of Soga Jûrô is Sawamura Sôjûrô I. 3rd lunar month of 1727: Danjûrô achieves a great success in the same theater by playing the role of Takenuki Gorô in the bombastic "Oshimodoshi" scene (Kabuki Jûhachiban) of the play "Kokusen'ya". Danjûrô and Sawamura Sôjûrô I play also the roles of Utsumi Shintarô and Seigen in the drama "Konrei Otowa no Taki", which includes a koroshiba well received by the audience. 4th lunar month of 1727: Danjûrô and Sawamura Sôjûrô I play in the same theater the roles of the rival warlords Takeda Shingen and Uesugi Kenshin in the drama "Kôyô Gun'u no Hanagasane". 11th lunar month of 1727: Danjûrô plays in the same theater the role of Ôtô no Miya in the kaomise drama "Yatsumune Taiheiki" [casting]. For the first time in Kabuki history, a trap door is used on a Kabuki stage for actors stage entrances (seri dashi). This program celebrates the return of Ôtani Hiroji I (along with the Kamigata actor Kirinami Onoe) in Edo after 5 years spent in Kyôto. This is also the first stage appearance for Ichikawa Masugorô, the adopted son of Danjûrô. 1st lunar month of 1728: Danjûrô and Sawamura Sôjûrô I play in the same theater the roles of Soga Gorô and Soga Jûrô in the new year sogamono "Soga Hôraisan". Their stage partners in the roles of Kudô Saemon Suketsune, Kobayashi no Asahina, Ôiso no Tora (Jûrô's lover) and Kewaizaka no Shôshô (Gorô's lover) are Ogawa Zengorô I, Ôtani Hiroji I, Kirinami Onoe and Sanjô Kantarô II. 11th lunar month of 1728: Danjûrô plays at the Nakamuraza the role of the warrior Tadanobu in the kaomise drama "Hoshi Kabuto Goban Tadanobu". His stage partners in the roles of Minamoto Yoshitsune, Kajiwara Genta, Tadanobu's wife Kowata, Shizuka Gozen and Kyô-no-Kimi are Sawamura Sôjûrô I, Ôtani Hiroji I, Tsugawa Kamon, Sanjô Kantarô II and Sodesaki Iseno I. 1st lunar month of 1729: premiere at the Nakamuraza of the short and bombastic "Ya-no-Ne" scene (Kabuki Jûhachiban), which is performed within the new year program "Suehiro Ehô Soga". Danjûrô and Sawamura Sôjûrô I play the leading roles of the brothers Soga Gorô and Soga Jûrô. The performance is a huge success and is extended up to the 5th lunar month. 11th lunar month of 1729: great kaomise at the Nakamuraza. The 4 tachiyaku Bandô Hikosaburô I, Sawamura Sôjûrô I, Ôtani Hiroji I and Danjûrô perform together in the play "Ume Goyomi Konrei Nagoya". Danjûrô portrays Nagoya Sanza, confronting Ôtani Hiroji I in the role of Fuwa Banzaemon. 1st lunar month of 1730: Danjûrô plays in the same theater the role of Komusô no Gorô (Soga Gorô disguised as Komusô) in the new year drama "Kura-biraki Takarara Soga". The performance is a commercial failure. 4th lunar month of 1730: Danjûrô plays in the same theater the role of Watônai in the drama "Karanishiki Kokusen'ya Gassen". Fall 1730: The actors Sawamura Sôjûrô I, Ôtani Hiroji I, Ogino Izaburô I, Bandô Hikosaburô I and Danjûrô perform together in the play "Meigetsu Gonin Otoko" ("Five men under the August moon"), which is staged in the same theater [casting]. 11th lunar month of 1730: Danjûrô plays in the same theater the role of Kawazu Saburô in the kaomise drama "Irifune Hiru-ga-Kojima". 1st lunar month of 1731: Danjûrô plays the role of Fuwa Banzaemon in the drama "Keisei Fukubiki Nagoya" ("The courtesan, the tombola drawing and Nagoya Sanza"), which is performed in the same theater [casting]. Spring 1731: Danjûrô plays in the same theater the role of Gotô Saemon in the drama "Muko Denju Nishiki no Tazuna", whose plot and characters belong to the "Oguri Hangan" world. His stage partners are Nakamura Shichisaburô II (Oguri Hangan), Ogino Izaburô I (Princess Terute), Segawa Kikunojô I (Tsumagi) and Sawamura Sôjûrô I (Onitsugu). 11th lunar month of 1731: Danjûrô plays at the Nakamuraza the role of Kusunoki Masatsura in the kaomise drama "Wagô Ichiji Taiheiki", which celebrates the arrival in Edo of the Kamigata star Sadoshima Chôgorô I. 1st lunar month of 1732: Danjûrô plays in the same theater the role of Oniô Shinzaemon in the new year sogamono "Hatsugoyomi Ainai Soga". 6th lunar month of 1732: bills start to announce in town the move of Danjûrô from the Nakamuraza to the Ichimuraza. 9th lunar month of 1732: final performance at the Nakamuraza for Danjûrô, who plays the great role of the warrior Kagekiyo in the drama "Ôichô Sakae Kagekiyo", commonly called "Kagekiyo" (Kabuki Jûhachiban) [casting]. 11th lunar month of 1732: Danjûrô moves to the Ichimuraza, playing the role of Sanada Yoichi in the kaomise drama "Tsuwamono Kongen Hiru-ga-Kojima". His stage partners are Ôtani Hiroji I, Segawa Kikujirô I and Bandô Hikosaburô I. 1st lunar month of 1733: Danjûrô plays in the same theater the roles of Soga Gorô and Soga Jûrô in the new year sogamono "Hanabusa Funjin Soga". His stage partner in the role of Kudô Saemon Suketsune, the ennemy of the Soga brothers, is Bandô Hikosaburô I. Danjûrô plays also the role of the shirozake seller Shinbê in "Sukeroku", which is staged as nibanme in this program. His stage partners in the roles of Sukeroku and Agemaki are Ichimura Takenojô IV and Segawa Kikujirô I. 3rd lunar month of 1733: Danjûrô plays in the same theater the role of the wicked priest Narukami in the drama "Ôsakayama Narukami Fudô". 11th lunar month of 1733: Danjûrô plays in the same theater the role of Kusunoki Masashige in the kaomise drama "Shôhon Taiheiki". 1st lunar month of 1734: Danjûrô plays in the same theater the role of Soga Gorô in the new year sogamono "Nanakusa Nigiwai Soga". His partner in the role of Soga Jûrô is the Kamigata star Arashi San'emon III. 3rd lunar month of 1734: Danjûrô, Ôtani Hiroji I, Bandô Hikosaburô I, Ichimura Takenojô IV and Sakata Hangorô I perform in the same theater in the otokodate drama "Gonin Otoko" but the performance is not a success. 5th lunar month of 1734: Danjûrô plays in the same theater the role of Inoshishi no Hayata in the drama "Yatsumune Ayame Genji". His stage partners in the roles of Minamoto no Yorimasa and Taira no Kiyomori are Ichimura Takenojô IV and Ôtani Hiroji I. Fall 1734: Danjûrô plays in the same theater the role of Fuwa Banzaemon in the drama "Kongen Imagawajô". 11th lunar month of 1734: Danjûrô plays the role of Heidayû Kunitae in the Ichimuraza kaomise drama "Michi-no-Ku Yunzei Genji". 1st lunar month of 1735: Danjûrô plays in the same theater the role of Oniô Shinzaemon in the new year drama "Furiwakegami Hatsugai Soga". 4th lunar month of 1735: Danjûrô falls ill.
11th lunar month of 1735: great shûmei at the Ichimuraza. Danjûrô gives his name to his adopted son and takes the name of Ichikawa Ebizô II, playing the role of Hata no Daizen in the kaomise drama "Kongen Nana Komachi". The actors Ichikawa Masugorô and Matsumoto Shichizô I respectively take the names of Ichikawa Danjûrô III and Matsumoto Kôshirô II. 4th lunar month of 1736: special program at the Ichimuraza commemorating the 32nd and 6th anniversaries of the death of Ichikawa Danjûrô I and Matsumoto Kôshirô I. Danjûrô plays the role of Shinozuka Gorô in the drama "Hobashira Taiheiki". Summer 1736: Ebizô plays in the same theater the role of Gotô Saemon in the drama "Tôkaidô Yukumi Guruma", whose plot and characters belong to the "Oguri Hangan" world. His stage partners are Ôtani Hiroji I (the thief Mokuzu no Sanpei), Segawa Kikunojô I (Sanpei's wife), Segawa Kikujirô I (the courtesan Onikage), Ichimura Takenojô IV (Oguri Hangan) and Ichikawa Danjûrô III (Ike no Shôji). 9th lunar month of 1736: Ebizô plays in the same theater the role of Meguro no Fudô ("black eyes Fudô") in the drama "Yonin Fudô" ("The Four Deities Fudô"). His stage partners in the roles of Mejiro no Fudô ("white eyes Fudô"), Meaka no Fudô ("red eyes Fudô") and Meao no Fudô ("blue eyes Fudô") are Ichikawa Danjûrô III, Ôtani Hiroji I and Ichimura Takenojô IV. 11th lunar month of 1736: Ebizô moves to the Kawarasakiza, playing the role of Shinozuka Iga-no-Kami in the kaomise drama "Jumpû Taiheiki", which includes a "Shibaraku" look-alike scene. His stage partners are Ichikawa Danzô I, Matsumoto Kôshirô II and Nakamura Shichisaburô II. 1st lunar month of 1737: Ebizô plays in the same theater the role of Soga Gorô Tokimune in the new year sogamono "Gozen Sumô Osana Soga". His stage partners in the roles of Soga Jûrô Sukenari and Kudô Saemon Suketsune are Nakamura Shichisaburô II and Ichikawa Danzô I. 7th lunar month of 1737: Ebizô plays in the same theater the role of Ôsaka no Gotô Saemon in the drama "Keisei Terute Takara Kuruma", whose plot and characters belong to the "Oguri Hangan" world. His stage partners are Ichikawa Danzô I (Fukagusa no Gotô Saemon), Sodesaki Kikutarô (Princess Terute), Nakamura Shichisaburô II (Oguri Hangan) and Ichikawa Danjûrô III (Ike no Shôji). 11th lunar month of 1737: the play "Dan no Ura Kabuto Gunki" is staged for the first time in Edo, at the Kawarasakiza, as a kaomise drama entitled "Urûzuki Ninin Kagekiyo"; Ebizô plays the role of Shigetada [casting]. The final act of this play is a confrontation scene between Ebizô and Ichikawa Danzô I in the roles of the statue of Kan U and the statue of Chô Hi (Kan U and Chô Hi are two legendary Chinese generals), which is commonly called "Kan U" (Kabuki Jûhachiban). 1st lunar month of 1738: Ebizô plays in the same theater the role of Shigetada in the new year program "Hatsu Midori Hônen no Shirabe". His stage partners in the roles of Akoya and Kagekiyo are Sodesaki Kikutarô and Ichikawa Danzô I. 11th lunar month of 1738: Ebizô and Ichikawa Danjûrô III move to the Ichimuraza and perform in the kaomise program "Mitsugibune Taiheiki". 1st lunar month of 1739: Ebizô plays in the same theater the role of Taira no Kagekiyo in the new year program "Hatsu Motoyui Kayoi Soga". 3rd lunar month of 1739: Ebizô plays in the same theater the role of Sukeroku in the drama "Sukeroku Jômon no Hanabusa". The roles of Agemaki (Sukeroku's lover) and Ikyû (Sukeroku's enemy) are played by Tomizawa Montarô I and Ichikawa Sôzaburô I. 7th lunar month of 1739: Ebizô plays in the same theater the role of Taira no Kagekiyo in the drama "Kasane Gedatsu no Hachisuba". 11th lunar month of 1739: Ebizô plays in the same theater the role of the Buddhist priest Kenkô in the kaomise drama "Tokiwagi Taiheiki". 1st lunar month of 1740: Ebizô plays in the same theater the role of the professional storyteller Bairyûken in the new year program "Hônen Eitai Gura" but the performance is a failure. 2nd lunar month of 1740: premiere at the Ichimuraza of the play "Sugatami Sumidagawa", in which Ebizô plays the role of Awazu Rokurô Saemon. The second part of this play contains a scene, which will be called "Nanatsu Men" ("Seven Masks") and belongs to the (Kabuki Jûhachiban. Ebizô uses 5 masks in this first version. This performance is a triumphant success. 11th lunar month of 1740: Ebizô moves to the Nakamuraza and plays the roles of Hata Rokurô Saemon and Soga Gorô Tokimune in the kaomise drama "Miya Bashira Taiheiki". He performs successfully the bombastic "Ya-no-Ne" scene. His stage partner in the role of Murakami Hikoshirô is Ichikawa Danzô III, who celebrates his shûmei. 1st lunar month of 1741: Ebizô plays in the same theater the roles of Kagekiyo and Soga Gorô Tokimune in the new year sogamono "Na no Hana Akebono no Soga". His stage partners in the roles of Soga Jûrô Sukenari, Kudô Saemon Suketsune, the courtesan Kewaizaka no Shôshô (Gorô's lover) and the courtesan Ôiso no Tora (Jûrô's lover) are Nakamura Shichisaburô II, Ichikawa Sôzaburô I, Arashi Tominosuke I and Tamazawa Saijirô I. 8th lunar month of 1741: last performance in Edo before going to Ôsaka. Ebizô plays the roles of the deity Fudô Myôô and Minamoto Yorimitsu in the drama "Uruoi Seiwa Genji" but it is not well received by the audience. 10th lunar month of 1741: Ebizô and Ichikawa Danjûrô III leave Edo the 13th and settle in Ôsaka the 24th. It is said that Ebizô accepted to perform in Ôsaka for the enormous amount of 2,000 ryô. 11th lunar month of 1741: Ebizô performs in the kaomise drama "Bankoku Taiheiki", which includes the "Uirô Uri" scene and is produced by Sadoshima Chôgorô I at the Ônishi no Shibai. 12th lunar month of 1741: Ebizô plays in the same theater the roles of Soga Gorô Tokimune and Soga Jûrô Sukenari in the drama "Yamato Ikioi Soga". His stage partners in the roles of Kudô Saemon Suketsune, the courtesan Kewaizaka no Shôshô (Gorô's lover) and the courtesan Ôiso no Tora (Jûrô's lover) are Yamamoto Kyôshirô I, Onoe Kikugorô I and Shibazaki Taminosuke. Ichikawa Danjûrô III falls suddenly ill the 14th, is replaced by Ichikawa Kinzaburô and leaves Ôsaka the 21st to go back to Edo. The performance, which started the 11th, is not a success and stops the 22nd. 1st lunar month of 1742: Ebizô's rank in the Ôsaka hyôbanki, tachiyaku section, is goku-jô-jô-kichi (extreme - superior - superior - excellent). He plays in the same theater the roles of the wicked priest Narukami, the senior retainer Kumedera Danjô and the deity Fudô Myôô in the drama "Narukami Fudô Kitayama Zakura" [casting]. The performance is a triumphant success and is extended up to the beginning of 7th lunar month of 1742. 2nd lunar month of 1742: Ichikawa Danjûrô III dies in Edo. 7th lunar month of 1742: Ebizô performs in the same theater in the play "Nanatsu Men", which is staged under the title "Hoshiai Sakae Kagekiyo". Ebizô uses 7 masks in this second version. 8th lunar month of 1742: Ebizô performs in the same theater in the play "Tosa Jirô Imose Kagami". 9th ~ 10th lunar months of 1742: Ebizô performs in the same theater in the play "Kan U", which is staged under the title "Higashiyamadono Asahi no Ôgi". 11th lunar month of 1742: Ebizô and Onoe Kikugorô I go to Edo together. The latter joins the Ichimuraza and the former plays the role of Hata Rokurô Saemon at the Kawarasakiza in the kaomise drama "Gaijin Taiheiki". 1st lunar month of 1743: Ebizô plays in the same theater the role of Karajishi Iwaonosuke in the new year program "Kongen Cha no Yu Yakata". 4th lunar month of 1743: Ebizô plays in the same theater the role of Taira no Kagekiyo in "Kagekiyo Utai Mondô". Fall 1743: Ebizô performs in the same theater in the drama "Sanshô Dayû" but he falls ill and has to rest for a while. 11th lunar month of 1743: Ebizô moves to the Nakamuraza and plays the role of Shinozuka Iga-no-Kami in the kaomise drama "Funayosooi Mitsugi Taiheiki". 1st lunar month of 1744: Ebizô plays in the same theater the role of Endô Musha Moritô in the new year program "Sazare Ishi Suehiro Soga". 2nd lunar month of 1744: premiere at the Nakamuraza of the Nagauta-based dôjôjimono "Momo Chidori Musume Dôjôji". The leading female role is played by Segawa Kikunojô I and his two stage partners are Ebizô and Ôtani Hiroji I. 11th lunar month of 1744: Ebizô performs in the same theater in the kaomise drama "Kachô Taiheiki". 1st lunar month of 1745: Ebizô plays in the same theater the role of Taira no Kagekiyo, disguised as Kudô Saemon Suketsune, in the new year drama "Hagoromo Kotobuki Soga". His stage partners in the roles of Soga Gorô Tokimune and Soga Jûrô Sukenari are Ogino Izaburô I and Nakamura Shichisaburô II. 7th lunar month of 1745: Ebizô plays in the same theater the role of Ôtomo no Kuronushi in the drama "Kuronushi Iroha Mondô" but his performance is not well received. 9th lunar month of 1745: Ebizô plays in the same theater the role of Watanabe Minbu in the drama "Higashiyama Dono Takara no Ishizue". 11th lunar month of 1745: Ebizô plays in the same theater the roles of Kumano Bettô and Soga Tarô in the kaomise drama "Suehiro Izu Nikki", which celebrates the arrival in Edo of the Kamigata actor Fujikawa Heikurô and the shûmei of Ôtani Hiroemon II and Nakamura Denkurô II. 1st lunar month of 1746: Ebizô plays in the same theater the roles of Kagekiyo and the statue of Daruma in the new year drama "Fuji no Yuki Mitsugi Soga". 11th lunar month of 1746: Ebizô plays in the same theater the roles of Hata Rokurô Saemon, Shinozuka Gorô, Watari Shinzaemon and the picture mounter Tarobei in the kaomise drama "Ame Tsuchi Taiheiki", which celebrates the arrival in Edo of the Kamigata actors Arashi Koroku I and Tsuuchi Monzaburô. 1st lunar month of 1747: Ebizô plays in the same theater the role of Taira no Kagekiyo in the new year drama "Kakizome Yawaragi Soga".His stage partner in the role of Akoya is Yoshizawa Ayame II. 5th lunar month of 1747: Ebizô plays the roles of Genzô and Kan Shôjô, transformed into the God of Thunder, in the drama "Sugawara Denju Tenarai Kagami", which is performed for the first time at the Nakamuraza [casting]. 11th lunar month of 1747: Ebizô plays in the same theater the roles of Matano Gorô and Taira no Kiyomori in the kaomise drama "Izu Gunzei Sumô no Nishiki", sharing the top of the bill with the 2 stars Sawamura Chôjûrô III and Segawa Kikunojô I. 1st lunar month of 1748: Ebizô's rank in the Edo hyôbanki, tachiyaku section, is dai-goku-jô-jô-kichi (grand - extreme - superior - superior - excellent). He plays in the same theater the role of Akushichibyôe Kagekiyo in the play "Kazari Ebi Yoroi Soga". 5th lunar month of 1748: premiere in Edo at the Nakamuraza of the play "Yoshitsune Senbon Zakura" in which Ebizô plays the roles of Yazaemon and Noritsune [casting]. 6th lunar month of 1748: Ebizô plays in the same theater the role of Takebe Genzô in the drama "Sugawara Denju Tenarai Kagami". His stage partners in the roles of Kan Shôjô and Matsuômaru are Nakamura Shichisaburô II and Ôtani Oniji I. 7th lunar month of 1748: Ebizô plays in the same theater the role of the Buddhist priest Onikage in the drama "Senshû no Kashima Date Oguri Jikki" but the performance is not successful. He also plays the eponymous role of the play "Kagekiyo". 11th lunar month of 1748: Ebizô plays at the Nakamuraza the roles of Hasebe Nobutsura and Watanabe Takiguchi in the kaomise drama "Onna Moji Heike Monogatari", which celebrates the arrival in Edo of the Kamigata actor Nakamura Kumetarô I. 1st lunar month of 1749: Ebizô's rank in the Edo hyôbanki, tachiyaku section, is goku-dai-murui (extreme - grand - unequaled). He plays in the same theater the roles of Kyô no Jirô, Matano Gorô, Kumagai Jirô Naozane, the priest Shunkan, Tomoe and the warrior Kagekiyo in the new year program "Otoko Moji Soga Monogatari". 3rd lunar month of 1749: Ebizô plays the role of Sukeroku in the drama Sukeroku Kuruwa no Ie Zakura. His stage partners in the roles of Agemaki (Sukeroku's lover) and Ikyû (Sukeroku's enemy) are Segawa Kikujirô I and Ichikawa Sôzaburô I. The Yoshiwara pleasure quarter of Edo started in early Spring 1749 to display cherry trees in pots in the heart of the precinct (Naka no Chô) in order to draw the crowds for cherry-blossom-viewing and more. Ebizô reproduces it on stage with fake cherry trees all along the stage. 6th lunar month of 1749: the play "Kanadehon Chûshingura" is produced at the Nakamuraza for the first time; Ebizô plays the roles of Amakawaya Gihei and Ôdachi Kumanosuke [casting]. Summer 1749: Ebizô falls ill and has to rest up to the beginning of 1750. 1st lunar month of 1750: Ebizô is back on stage, at the Nakamuraza, playing the role of Taira Kagekiyo, disguised as the hunter Shichibei, in the drama "Ôkazari Saiwai Soga". The role of Chichibu no Shôji Shigetada is played by Sawamura Chôjûrô III. 4th lunar month of 1750: Ebizô plays in the same theater the role of Kyô no Jirô in the drama "Shigetada Kariba Nikki". His stage partner in the role of Jirô's wife Karaito is Segawa Kikujirô I. 11th lunar month of 1750: Ebizô moves to the Ichimuraza and plays the roles of Shinozuka Iga-no-Kami, Watari Shinzaemon and Kuryû Danjô Saemon in the kaomise drama "Gaijin Taiheiki", which celebrates the shûmei of Arashi Sanpachi I. The aragoto role of Kuryû Danjô Saemon, brandishing an ax and pursuing the villains who attacked Lady Kikusui (played by Onoe Kikugorô I), is similar to the role of Soga Gorô in the "Ya-no-Ne" scene. 1st lunar month of 1751: Ebizô play in the same theater the roles of the medecine peddler and Awazu Rokurô Saemon in the new year drama "Hatsuhana Sumidagawa", which includes the "Uirô Uri" scene. 3rd lunar month of 1751: Ebizô's rank in the Edo hyôbanki, tachiyaku section, is dai-shigoku-meijin-jô-jô-kichi (grand - exceedingly - master - superior - superior - excellent). He plays the role of the wicked priest Narukami in the drama "Narukami Shônin Kitayama Zakura". His stage partner in the role of Princess Taema is Onoe Kikugorô I. 7th lunar month of 1751: Ebizô play in the same theater the role of Sasaki Moritsuna in the drama "Sasaki Moritsuna Fujito Nikki", "murdering" on stage his partner Onoe Kikugorô I. He performs also at the end of the play the role of the statue of the deity Fudôson. 11th lunar month of 1751: Ebizô plays at the Ichimuraza the role of Hasebe Chôbê in the kaomise drama "Kamimukae Nigiwai Genji", which celebrates the shûmei of Bandô Hikosaburô II and welcomes in Edo the Kamigata actor Arashi Shichigorô I. 1st lunar month of 1752: Ebizô's rank in the Edo hyôbanki, tachiyaku section, is dai-shigoku-jô-jô-kichi (grand - exceedingly - superior - superior - excellent). He plays the roles of Kagekiyo and Kudô Saemon Suketsune in the new year program "Suzuriha Sugatami Soga", which is staged at the Ichimuraza. 7th lunar month of 1752: Ebizô plays in the same theater the role of Fuwa Banzaemon in the drama "Hitokanade Taihei Nagoya" but he falls ill during the performance and has to be replaced. He's convalescent for 14 months. 1753: the Kabuki world commemorates the 49th anniversary (50th memorial service) of the passing away of Ichikawa Danjûrô I. Ebizô and his son Matsumoto Kôshirô II finance the erection of a memorial stone in the front approach of Kôyasan temple in the Wakayama province. No memorial performance in Edo theaters because of the bad health condition of Ebizô. 11th lunar month of 1753: Ebizô is back on stage, at the Nakamuraza, playing the roles of Shinozuka Iga-no-Kami, Hata Rokurô Saemon, Bara Mitsujo (?) and the Chinese Shuikki in the drama "Hyakumanki Tsuwamono Taiheiki", which includes a "Shibaraku" scene. 1st lunar month of 1754: Ebizô plays in the same theater the roles of Kudô Saemon Suketsune (third time), Soga Gorô, the Buddhist priest Renshô and the deity Aizen Myôô in the new year program "Momo Chidori Kuruwa Soga", which includes the "Ya-no-Ne" scene (presented to the audience as a once-in-a-lifetime performance of Ebizô) and commemorates the 12th anniversary (13th memorial service) of the death of Ichikawa Danjûrô III. This performance is a triumphant success and is extended up to the 6th lunar month. 7th lunar month of 1754: Ebizô plays in the same theater the role of Yamamoto Kansuke in the drama "Kongen Okuni Kabuki". His stage partners in the roles of Ômi no Okane, Umetada Tokubê and Matsunaga Danjô are Nakamura Tomijûrô I, Ôtani Hiroji II and Nakamura Sukegorô I. 9th lunar month of 1754: Ebizô plays in the same theater the role of Yamanaka Shikanosuke in the drama "Kama-ga-Fuchi On'ai no Kata Tazuna". 11th lunar month of 1754: Ebizô plays at the Nakamuraza the roles of Miura no Ôsuke and Wada Yoshimori in the kaomise drama "Miura no Ôsuke Bumon no Kotobuki", which celebrates the shûmei of Ichikawa Danjûrô IV, Matsumoto Kôshirô III and Tsuuchi Monzaburô II. 1st lunar month of 1755: Ebizô's rank in the Edo hyôbanki, murui section (the "unequaled" section, created especially for Ebizô and Suketakaya Takasuke I), is dai-shigoku-jô-jô-kichi (grand - exceedingly - superior - superior - excellent). Ebizô plays in the same theater the roles of Kudô Saemon Suketsune and Kagekiyo in the new year sogamono "Waka Midori Nishiki Soga"; his stage partners in the roles of Soga Gorô Tokimune and Soga Jûrô Sukenari are Ichikawa Yaozô I and Nakamura Shichisaburô II. 8th lunar month of 1755: Ebizô plays in the same theater the roles of Ukishima Danjô and Utsumbo in the drama "Shida Chôja Bashira". 11th lunar month of 1755: Ebizô plays in the same theater the roles of Hasebe Chôbê and the deity Namikiri Fudô Myôô in the kaomise drama "Arigatashi Yunzei Genji". 14th day of the 1st lunar month of 1756: the Nakamuraza and the Ichimuraza are destroyed in a fire. 2nd lunar month of 1756: the Nakamuraza is rebuilt and Ebizô plays the role of Oniô Shinzaemon in the drama "Kotobuki Mimasu Soga" - Mimasu is the blazon (3 squares fitting into each other and representing 3 measures of rice) of the Naritaya guild. His stage partners in the roles of Nagoya Sanza, Fuwa Banzaemon, Katsuragi (Sanza's lover) and Banzaemon's wife are Yamashita Matatarô I, Ichikawa Danjûrô IV, Nakamura Kiyosaburô I and Nakamura Tomijûrô I. 4th lunar month of 1756: Ebizô plays in the same theater the roles of Ôe no Saemon and the spirit of a Monkey in the drama "Chôseiden Fudan Zakura". 7th lunar month of 1756: Ebizô plays in the same theater the roles of Kanki and Ogata Saburô disguised as the playwright Chikamatsu Monzaemon in the drama "Zôho Kokusen'ya Gassen" (enlarged and revised version of Chikamatsu Monzaemon's "Kokusen'ya Gassen"). The performance is a commercial failure. 8th lunar month of 1756: Ebizô plays in the same theater the role of Kan Shôjô, transformed into the God of Thunder, in the drama "Sugawara Denju Tenarai Kagami". 11th lunar month of 1756: Ebizô moves to the Ichimuraza, leaving Ichikawa Danjûrô IV and Matsumoto Kôshirô III at the Nakamuraza, and plays the role of Shibuya Konnômaru (the leading role of the "Shibaraku" scene) in the kaomise drama "Kaeribana Kon'ô Zakura". He also plays the role of the Chinese warrior Kan U in the dance drama "Momo Chidori Musume Dôjôji", which celebrates the shûmei of Segawa Kikunojô II. 2nd lunar month of 1757: Ebizô plays in the same theater the role of Taira no Kagekiyo in the new year program "Some Tazuna Hatsuuma Soga", which includes the "Uirô Uri" scene (performed for the seventh time by Ebizô). He falls ill at the end of the performance and is convalescent up to the 3rd lunar month of 1758. 3rd lunar month of 1758: Ebizô appears on stage for the last time, at the Ichimuraza, playing the role of Soga Gorô in the bombastic scene "Ya-no-Ne", which is part of the drama "Koizome Sumidagawa". He falls ill and has to retire in his cottage in the village of Meguro, not so far from the Fudôson temple. He dies there a few months later, in September, and his tombstone is located in the Jôshôin temple in the district of Shiba. Outstanding tachiyaku and praiseworthy successor of his father, Ichikawa Ebizô II was one of the leading Edo actors from the Kyôhô era to the middle of the Hôreki era. He reached the jô-jô-kichi rank in the 1st lunar month of 1712 and the goku-jô-jô-kichi rank in the 2nd lunar month of 1720. Ichikawa Ebizô II is also the creator of several bombastic plays belonging to the Kabuki Jûhachiban collection: "Uirô Uri" (1st lunar month of 1718), "Oshimodoshi" (3rd lunar month of 1727), "Ya-no-Ne" (1st lunar month of 1729), "Kagekiyo" (9th lunar month of 1732), "Kan U" (11th lunar month of 1737), "Nanatsu Men" (2nd lunar month of 1740) and "Kenuki" (1st lunar month of 1742). He also decided to include the "Shibaraku" scene, created by his father as part of a longer play, in almost all the Edo kaomise which he took part in. Ichikawa Ebizô II was one of the 4 stars called Shitennô ("the big four", this expression comes from the four Deva kings in Buddhism) by the Edo audience (the three others were Sawamura Sôjûrô I, Bandô Hikosaburô I and Ôtani Hiroji I).